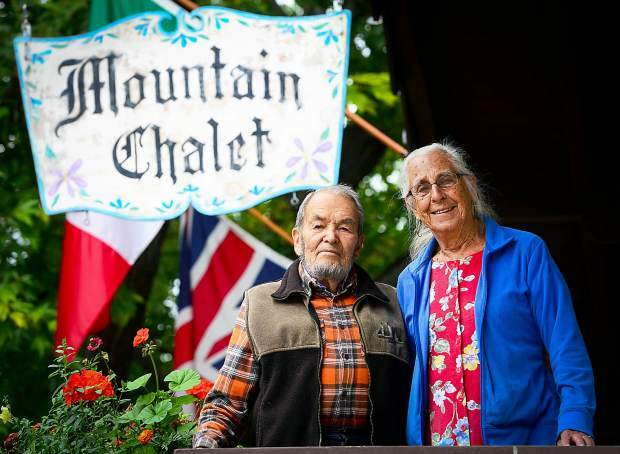 Ralph and Marian Melville pose in September 2013 in front of the Mountain Chalet Aspen, the ski lodge Ralph began building in 1954. Aspen lost a key character in the ski resort’s rise to fame and one of its most successful hoteliers when Ralph Melville passed away Monday at age 90. Melville earned a degree in physics from Dartmouth in 1950 and learned carpentry working for his dad’s development company in Massachusetts, but he eschewed opportunities in those fields to pursue his dream of running a lodge in the mountains. After serving in the U.S. Navy from 1943-46, then earning his degree from Dartmouth, Melville visited the White Mountains of New Hampshire and worked at a lodge at Pinkham Notch. His friend Brookie Dodge, who skied in the 1950 FIS World Championships in Aspen, urged him to visit the fledgling resort. Melville arrived in February 1951 as a ski bum and worked as a soda jerk at Matthews Drug and at the Sundeck for Howard Awry. He thought there were too many beds for too few tourists so he left town that spring thinking it didn’t offer enough opportunity for a young entrepreneur. He returned for a second look in winter 1953 and got a lucky break — injuring an ankle in a ski accident. It gave him time to contemplate life and Aspen. He bought two city lots near the base of Aspen Mountain for $2,000. “If I hadn’t broken my ankle I probably would have just skied here and left,” Melville told The Aspen Times in December 2004. He returned to Aspen for good in the summer of 1954 and started constructing a chalet. This time around, he was too busy for skiing. Melville opened three rooms at the Mountain Chalet for Christmas 1954 and eventually opened nine rooms that winter. All the while he also built houses for people as the town started to boom. He needed the work to pay for his new chalet. Marian Headley was the archetype Aspen ski bum in 1955-56, according to her daughter, Julie Melville. Marian and Ralph met in June 1956, had a whirlwind romance and were married in August. In between their meeting and wedding, Ralph survived a fall on North Maroon Peak that easily could have killed him. 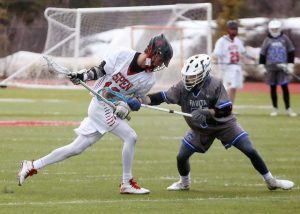 “My knee was part way up my hip,” he told The Aspen Times last summer. Many of Ralph’s climbing partners were involved in his rescue. The fall cemented his involvement in what became Mountain Rescue Aspen. About eight people were involved in the early years of the rescue group, he said last year. Business operators like him would drop what they were doing to help out people in need. Melville stayed involved in Mountain Rescue into the early 1990s. “Ralph was one of the experienced mountaineers that I revered when I joined the team,” said David Swersky, who joined Mountain Rescue in 1980 and is a past president and unofficial historian. The original team members had a great sense of duty and regularly gave up what they were doing to mount a rescue or retrieval, Swersky said. He remembered Melville as quiet, humble and always willing to help. That’s a reoccurring theme among comments of the people who knew him best. Melville would spend time with inmates at the Pitkin County Jail and offer a room, when available, to persons who were homeless, battling addictions or otherwise down on their luck. Ralph has a long list of civic accomplishments over six decades in Aspen. He was a founding member of the Aspen Rotary, he served on the school board and briefly on City Council, he was a director of First National Bank and participated in Gideon’s International. He helped organize the first Aspen package to combine lift tickets and lodging. For years he offered rooms at the chalet for Aspen Music School students. His faith was very important to him, and he remained an active member of the Baptist congregation, now known as Crossroads Church of Aspen. “As true Christians, Ralph and his wife Marian practiced the teachings of Christ, rather than just preach them,” Hopton wrote. Ralph’s daughter Julie said “compassion and serving” were central characteristics of her dad’s personality. “He was very patient with people no matter what their circumstance was,” she said. He expressed a desire that people “show kindness in his honor” and “step up and do things” for others to mark his passing. Ralph will likely be remembered best for his tight connection to the chalet he built. He ate, slept and breathed the Mountain Chalet. Jony Larrowe was establishing the Edelweiss Chalet in Aspen in the early 1950s with her husband at the time, Harry Poschman. They had children about the same age as the Melvilles and all the families knew one another. She admired Ralph and Marian for the way they operated their lodge and how they expanded when possible. Marian said she and Ralph would borrow money to purchase land or to construct an addition, then work hard to pay it off before borrowing anymore. They eventually built 55 rooms and four apartments, with a swimming room and conference space. The bricks and mortar weren’t the important part of what the Melville’s built. While the initial clientele was heavy skiers and well-known people, Mountain Chalet’s bread-and-butter became families, according to Marian. Frank recalled that he made friends with kids his age who would come out with their families year after year for the same week during ski season. “It was always old home week at the hotel,” Julie said. All of the Melville’s six kids and two foster children chipped in at the lodge. Julie said they were all “chambermaids and maintenance men” at an early age. Ralph and Marian always kept a connection with their customers. Ralph had breakfast at the chalet every day he was in Aspen. Dining with Ralph was a special part of the vacation for some people, Frank said. Ralph also started and regularly attended the Monday apres-ski gluhwein gathering. One notable group that came to the Mountain Chalet year after year was the Skiing Saints of Dearborn, Michigan. Father Bill Brennan started bringing the youth group in 1961. Brennan told The Aspen Times in 2003 he couldn’t continue the visit without the generosity of the Melvilles. The Melvilles were jointly inducted into the Aspen Hall of Fame in 1997 for their contributions to the town. They also made their mark on Snowmass Village. 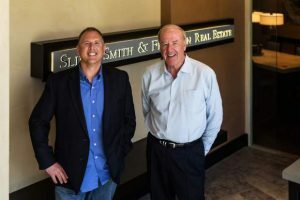 The Melvilles were invited by the developers of Snowmass Village to open a hotel there. The Mountain Chalet, patterned after Aspen, opened in 1967. They sold it 20-some years later. Ralph’s family said he was never seriously tempted to sell the lucrative Aspen business and property. Aspen property values became so valuable that many mom-and-pop lodges sold out. “I guess Poppa was just good at saying ‘no,’” Craig said. The Mountain Chalet was “exactly what he hoped for,” Marian said. He aimed to keep rates affordable for visitors while still making a living. Ralph battled leukemia for an extended time. A memorial will be held at Crossroads Church of Aspen on March 6 at 3:30 p.m.